In the school setting, occupational therapists focus on the daily occupations of school life. They work with students who have disabilities to achieve success in the classroom and across all school environments. Fine motor skills refers to using the small muscles in the hands and arms to move objects and complete tasks. Fine motor skills let children perform crucial tasks like reaching and grasping, moving objects and using tools like crayons, pencils and scissors. Grasp - Pictured below is a developmental sequence for developing a "preferred" pencil grasp for handwriting. It's important to note that preferred does not always mean functional. Tracing - 4 years old - should be able to trace simple shapes. 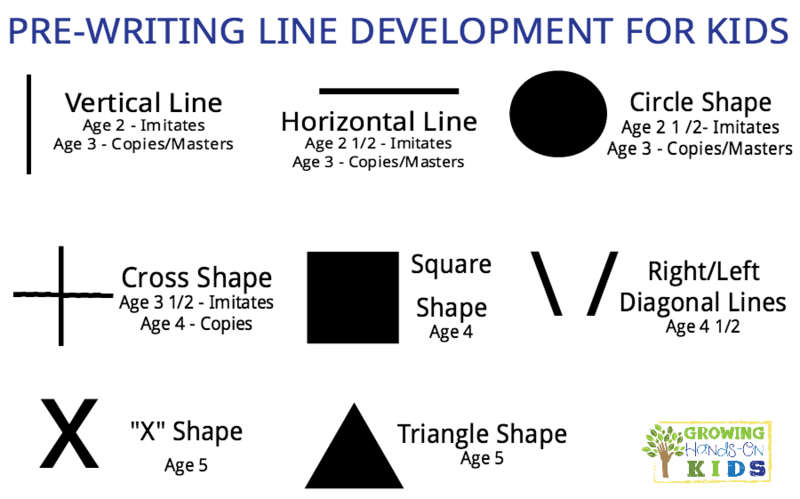 Design Copy - Copying the lines shown below are important prerequisites to handwriting letters. Processing sensory information begins as early as in utero as the sensory systems begin to form and continues to develop during infancy. Overwhelmed infants begin to learn self regulation in order to calm or self soothe. As motor skills develop, so do the vestibular and proprioceptive senses, as these sensations of movement come from the body. As the infant matures into a toddler, and then into school-age he or she will continue to improve sensory processing skills through maturation and exploration of his or he environment. The vestibular system is responsible to provide information regarding movement and balance. Proprioception is the ability of your muscles and joints to determine where they are in space. Visual motor integration, sometimes referred to as eye-hand coordination, is the ability to respond to visual input with a motor action. Catching a tossed ball is an example of this. Visual motor integration is also inherent in many academic skills such as, drawing and coloring, using scissors, copying from a board, and getting food on a fork. Visual Perception refers to what the eyes see and how the brain interprets that visual information. Visual perception consists of 7 separate skills and each one plays a pivotal role in academic skills like, handwriting, reading, writing solutions to math problems, copying from a board, maintaining visual attention, and organizing materials. ​​​​​​​Daily living skills, aka self-care or self-help skills are those skills are those skills that we do to ready ourselves for other daily activities. Basic dressing, grooming, feeding, and bathing tasks are examples of this. In school, these skills can impact children socially but there are also school specific daily living skills, such as opening a locker, getting food from the cafeteria, and opening and closing a book bag, just to name a few. Many of the skills that are addressed by OT in the schools are best improved in school when supported at home. However, so many tasks and activities at home use the same processes, muscles, grips, pinches, etc that are used in school. Below you'll find activity ideas that can be fun and functional, or both, but they should always be fun! encourage your child to eat small finger foods for snacks (if able to without choking). use tweezers to pick up small objects. use tongs to help serve salad, rolls, ice, etc. play games such as using small building blocks, marbles, wind up toys, peg games (Lite Brite™, Battleship™) and/or travel games with small parts. It should be noted that no 2 child's sensory needs are alike and it is possible to provide too much or too little. Contact your school's OT with any questions regarding what might be "just right" for your child. movement activities on the playground, crawling through tunnels, participating in sports, etc. activities that encourage body awareness such as obstacle courses where the child has to go up, over, in between, through, etc. physical activity where the child has to move through space such as using ride on toys, scooters, swings, rolling down a hill, etc. pushing (compresses the nerve endings) and pulling (stretches the nerve endings) activities ie push a heavy basket, pull a loaded wagon, etc. climb playground equipment, use monkey bars, play tug of war, etc. practice catching, throwing, kicking and hitting. using your whole arm and hand, use sidewalk chalk). play movement games that encourage right/left discrimination, avoiding obstacles, stopping/starting, etc. complete letter, number or word searches, hidden picture puzzles. All daily living skills include some sort of combination of the fine motor, sensory processing, and visual skills listed above. So, completing some of the above listed activities will certainly help to build daily living skills. However, practice of the actual skill is ultimately the best way to build daily living skills. Support your child as much as they need but try to fade that support away until they are as independent as possible. Tell me and I forget, teach me and I may remember, involve me and I'll understand. This section is to be used as a guide for interventions. Please use the Parents and General Information tabs for additional information too. You should be able to find a number of activities to use as interventions related to your concerns and observations. Interventions should be completed for AT LEAST 2 weeks prior to submitting a referral for a formal OT evaluation. However, we highly encourage you to work with your school's OT on these interventions in order to best help your student. A child’s sensory environment and sensory-filled activities during the day can have a significant positive impact on his or her ability to attend to an activity and learn. Modifying a student’s environment and schedule to allow calming/alerting activities may enable students to become more effective learners. Because sensory activities are important for students to be able to stay engaged, these activities should NOT be withheld and used as a reward. Reversely, when a student displays undesired behaviors, sensory breaks prior to undesired behaviors may result in an improvement in behavior. It is helpful to track when a child exhibits undesired behaviors and allow sensory breaks prior to these times. Planning sensory breaks and activities into the student’s daily schedule can be an effective behavior management tool. Each child responds differently to specific sensory intervention therefore it is not appropriate to provide a detailed sensory routine that will work for all students. If teachers suspect that a student has specific sensory needs, please consult with the OT assigned to your school to discuss particular strategies. Most children, especially those with sensory integration difficulties, benefit from a predictable schedule. Each morning, review the schedule for the day. If there are changes from the typical routine, discuss these with the class. It may be helpful to use a picture schedule on the board or on a child’s desk. If possible, discuss unexpected events before they happen (e.g. fire drills, assemblies) to allow the child time to prepare. It may be helpful to come up with a story that describes how the child should act in each situation. To assist students transition from one activity to another, use a “clean-up” song or “new activity” song to help the child prepare to end one activity and begin another activity. During independent work times, play classical music in the background. Have a quiet corner in the classroom where individual students can read or listen to music if they are feeling overwhelmed. Instruct the child to take deep breaths prior to transitioning. Have children perform “heavy work” activities such as pushing the wall over, chair pushups, carry books to the library or carry “cold lunch bin” to the cafeteria. Allow the class frequent movement breaks. These breaks can be short and include stretching, deep breathing, oral motor “snack”, heavy work, walks, brain breaks or a change of pace. Limit the amount of visual material on the walls or hanging from the ceiling. Store fine motor/math manipulative and other colorful activities in plastic boxes or cubbies out of the child’s sight. Organize the classroom and create a specific place for books, activities, and other items to be stored out of sight. It may be helpful to take pictures of items and tape the picture where the item belongs. Limit the amount of auditory input by closing doors and windows in the classroom. If a child is distractible or has a sensitivity toward auditory input, locate the desk away from doors, windows, fans, or the loud speaker. When possible, prepare a child who is sensitive to auditory input for fire drills, morning announcements, or recess bells.